Hans Bridger Heruth: Bio & Choral Music | Santa Barbara Music Publishing, Inc.
Hans Bridger Heruth [b. 1997] is an award winning composer pursuing a Bachelor of Music degree in composition and vocal performance at the University of Missouri on a composition scholarship from the Sinquefield Charitable Foundation. Heruth's works have been performed by many different ensembles, including the orchestras and choirs of the Liberty Public School District, select members of the University of Missouri Philharmonic, Creating Original Music Project ensembles, the Midwest Chamber Ensemble, the Columbia Civic Orchestra, and Deviant Septet, an ensemble that features members from the world renowned new music ensemble Alarm Will Sound. Heruth began his career in composition in his early teens when he realized he had a passion for creating music. He has since flourished, having received many accolades and commissions by the time he came to the University. 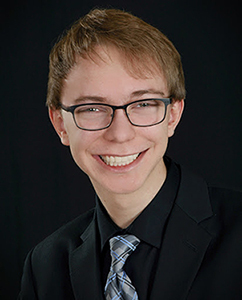 He is a three-time winner of the Mizzou New Music Initiative's Creating Original Music Project competition in the senior division, was awarded the 2015 Missouri Composers Orchestra Project prize in the high school division, and was a finalist for both the 2015 Sinquefield Prize in Composition and the 2016 ASCAP Morton Gould Young Composers Award. Due to his success in the field of composition, he judged the 2016 Mizzou New Music Initiative's Creating Original Music Project competition. Heruth is also a member of ASCAP and is published with both Heruth Publications and Santa Barbara Music Publishing. Hans Bridger Heruth has 3 titles published with Santa Barbara.